MHI - the former Materials Handling Institute of America - continues its aggressive moves to become a supply chain focused organization from its long roots in materials handling systems with a new initiative aimed at promoting careers in supply chain. Called iWorkinTheSupplyChain, the effort is focused on increasing awareness of careers in supply chain and championing the role of blue and white collars serving in supply chain related positions. Whether iWorkinTheSupplyChain takes off will of course remain to be seen, but MHI continues to invest time and resources in its efforts at transforming itself into a supply chain force. The awareness campaign has a number of elements, starting with a home page that features a number of individuals working in the supply chain who share their stories of how they came upon a supply chain related career and their current roles. This will be an on-going effort, presumably with dozens or hundreds of other supply chainers sharing their personnel stories in coming months and maybe years by posting to a blog on the site. Each post can include links on YouTube or other sites where a person's story can be told in video form as well. Those posting on the blog are automatically entered to win the 2016 MHI "Face of Supply Chain" award. This designation will honor a supply chain professional whose personal story "demonstrates the hard work, creative-thinking and a commitment to innovation it takes to succeed in this industry," according to MHI. • The nominee's story as it ties together the influence the supply chain has had on them, their company, family, and/or their community. • The nominee's ability to create positive impact on the people around them. • The nominee should be respected and recognized by his/her peers within their company. Diane Garforth, Director of Distribution Systems for retailer David's Bridal, for example, offers her story of starting her career off as a distribution center temp workers at the company before eventually rising to her current director level position. The award winner will be announced at MODEX 2016 trade show April 4-7 in Atlanta. 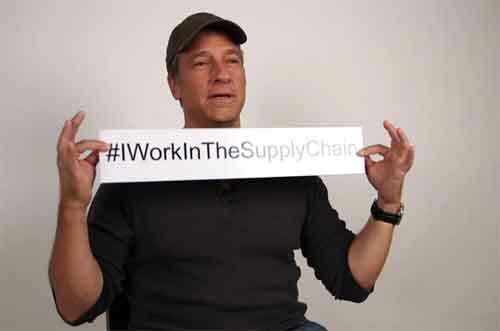 In addition to those personal stories, the new MHI web site include a four and a half minute video of a variety of individuals talking about their connections to the supply chain, including well known television personality Mike Rowe, captured as with others in the video at MHI's annual conference in Jacksonville, FL in early October, where Rowe was a keynote speaker. Naturally enough today, there is also a Twitter feed, which can be found at #iworkinthesupplychain. There are several tangents to this new campaign. First, it is connected to MHI's recent focus on a "talent shortage" across many areas of the supply chain, a theme Daniel Stanton, who came to MHI from Caterpillar as vice president of education and professional development in 2014, has been emphasizing since his arrival. In an email sent out announcing this new campaign, MHI noted that "that while more than 11 million people work in the supply chain, 8.6% of the nation's workforce, a shortage of skilled supply chain workers remains. An estimated 600,000 manufacturing positions in the U.S. are unfilled for a lack of qualified workers," while MHI also stated that between now and 2018, there will be 1.4 million new jobs openings in the logistics and supply chain field that companies may have trouble filling. Second, this move is just the latest in a series of actions to position MHI as a supply chain focused organization - and one reaching out to individual practitioners, not just the materials handling focused company memberships that have driven the organization since its inception. As SCDigest editor Dan Gilmore wrote in a trip report on the 2015 MHI conference: "Under relatively new MHI CEO George Prest, the organization has become much more aggressive, and is clearly swinging for the more general supply chain fences. That manifests itself, for example, in the bi-annual MODEX show in Atlanta, which MHI has had some success in positioning as a true supply chain event, versus the historical focus of the other year ProMat show on traditional materials handling." He added that "The name change to just MHI is of course also reflective of this strategy, as was the development in 2014 of the US Roadmap for Material Handling & Logistics, which clearly has an overall supply chain orientation despite the title." Whether iWorkinTheSupplyChain takes off will of course remain to be seen, but MHI continues to invest time and resources in its efforts at transforming itself into a supply chain force well beyond conveyor systems and AGVs, and those efforts are sure to continue. What do you think of this MHI campaign? Smart idea or not? Let us know your thoughts at the Feedback button below (email) or in the Feedback section. Anonymity will be provided upon request.